As with our daughter, we are so thrilled with our son's progress since attending Mathnasium. He scored a 4 on his EOGs and his confidence with test taking has improved exponentially. He loves coming every week and is eager to do well. Thank you! "Hey Jordan, I'd like to thank you for your help in Mathnasuim. You helped me a lot with understanding concepts and you taught me well. I just wanted to tell you that I got a B on my precalc final and thank you for your help." 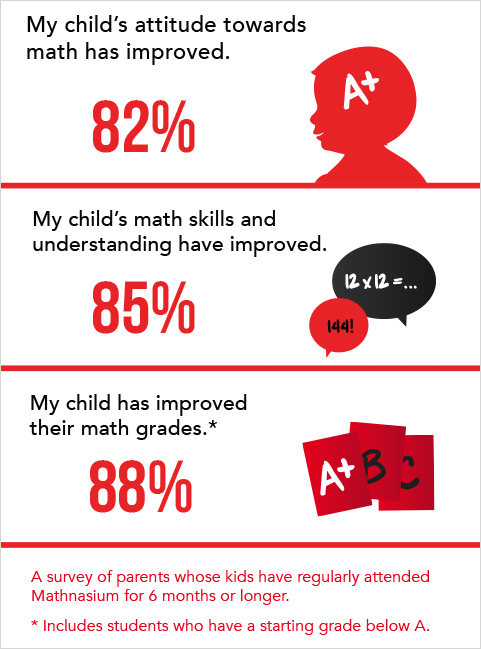 "I think Mathnasium is a great place to learn math. The tutors are very nice. Whenever I am here, I have a great time." "Hi Denise, My wife and I wanted to express our thanks for the great effort by Chad, Leah, Rachel and the whole team at Cary Mathnasium! Our daughter's overall 7th grade average has been raised from a D in late Feb to an A at the end of June. Her EOG score was a 4. Again, thank you for the great effort and If she happens to need some remedial tutoring or falls behind in 8th grade we will surely be visiting you again." Visit mathnasium.com/videotestimonials.html to see even more testimonials from students and teachers.